This week, the University of Groningen organized the 3 Minute Thesis Competition 2019: 12 PhD students presented their research to a non-specialist audience and a panel of judges in only three minutes, with just one slide. 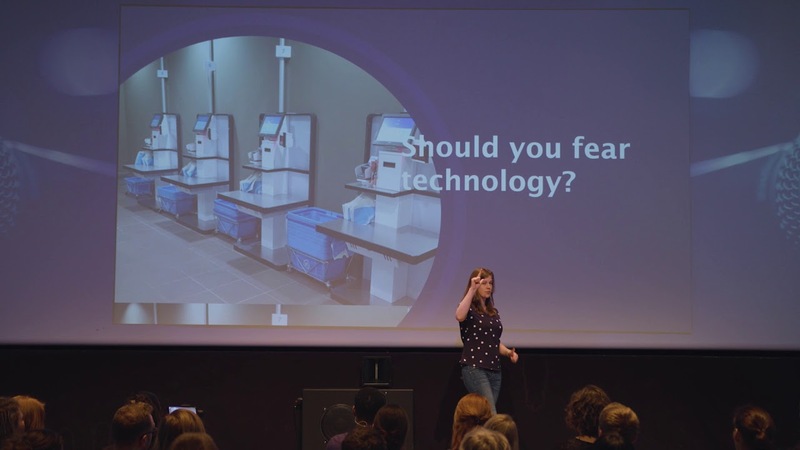 The winner of the UG #3MT competition was Femke Cnossen of the Faculty of Economics and Business, with a presentation on her research about the effects of automation and globalization on the wages and careers of Dutch workers. The runner up of the competition was Suzanne Schot from the Faculty of Law who studies testimonial evidence in situations of mass atrocities. Her pitch was entitled ‘Mass Atrocities: Proving the Unprovable by Telling the Untellable’. Nutifafa Doumon (Faculty of Science and Engineering) won the people’s choice award for his presentation on the degradation of organic solar cells and how to make them more stable. Cnossen received up to €1,250 travel expenses for an international conference and, if she will prove to be one of the shortlisted candidates for the Coimbra Group Finals, funded travel and accommodation to represent the University of Groningen at the Coimbra Group Conference in Krakow. ‘My name is Femke Cnossen and my work is to study work. I am a PhD student in labour economics from the faculty of economics and business. Here, I spend my days studying the effects of automation and globalization on the wages and careers of Dutch workers. Some of these workers are left empty-handed, because firms are offshoring work to cheaper countries or replacing workers by robots, machines and computers. Over the past decades, this has created inequalities between different groups of workers. The highly skilled workers are thriving: their wages are higher than ever and their employment is secure. On the other hand, some other workers are hurt by these trends. I am trying to discover who has benefited and who hasn’t. Fore more information see also the 3 Minute Thesis Competition 2019 website. Last modified: 18 March 2019 11.36 a.m.